Here’s a fire starter that’s easy to make from materials you probably already have floating around your house. These little balls of fire will burn for approximately 15 minutes after being lit, giving you plenty of time to get a fire going even if you have to dry out some of the wood. I keep them in my car emergency kit and take them camping. Ready to get started? Dryer lint–any variety will do. Egg carton–doesn’t matter if it’s a dozen, 18 or the “flats” as long as it’s the pressed paper kind, NOT styrofoam or whatever else they might make egg cartons out of. Wax–from old candles, crayons, or buy paraffin wax at the store (although it’s cheaper to buy cheap big candles at the thrift store or yard sale for this job–it doesn’t have to be food grade wax). A sense of adventure–just kidding, if you didn’t have that already you wouldn’t be here! 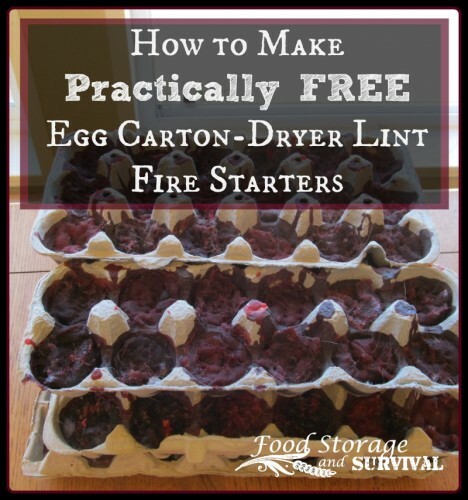 First, get your egg carton and collect your dryer lint by cleaning off the lint trap of your dryer. DO NOT throw it away (I actually feel bad throwing dryer lint in the trash!). If you don’t do enough laundry at your own house, maybe you could spend an afternoon at the local laundromat and collect lint there. 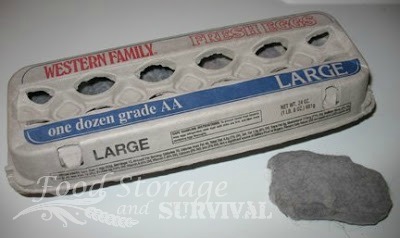 Next, stuff the dryer lint in the egg carton where the eggs used to be. Don’t stuff too tight or your wax won’t be able to penetrate the lint ball and it won’t light and burn very well. If you don’t do a lot of laundry, this may take a while to fill a carton, if you’re like me and washing clothes all the time, you might fill a whole dozen with a full day’s laundry. Again, it doesn’t have to be packed in tight. Now, set up a double boiler to melt your wax. You need a pot with water in it, and a can of some kind (I like the big V-8, tomato juice, apple juice, pineapple juice cans). Your can must be METAL and fit inside your pot of water with room to spare around it. Do not use a smaller pot that you like (or that is part of your double boiler setup) as your can–you’ll be melting wax in it and will likely ruin it! 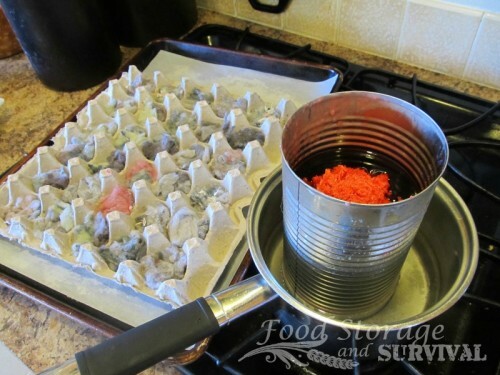 Put your wax in the can and the can in the pot of water and heat the water. The wax will melt inside the can. 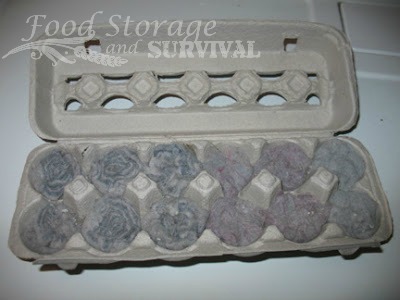 Put your egg carton on something that the wax can leak through onto (like waxed paper, foil, cardboard, or something you don’t care about) because some of the wax will soak through the egg carton. 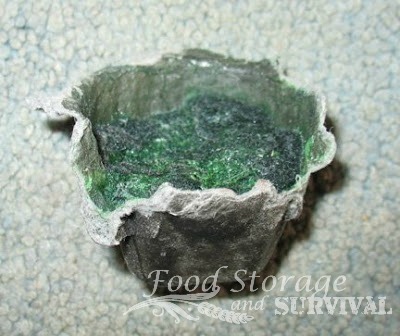 When the wax is melted, scoop or pour it onto the lint in the egg carton. Make sure it soaks all the lint. You might want to get a fork or stick and smush it around in the egg cup a bit to ensure it is saturated all the way through. When you’re done waxing the lint, let it cool and harden and voila! Cheapo fire starters! You can leave them all together in the shape of an egg carton and then tear them off one at a time, or tear them all apart and store them separately. They won’t light with a spark, so you’ll need matches or a lighter to get them burning. 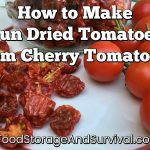 Throw some in your emergency kit, car kit, camping kit, whatever else kit you have that has matches in it. In our fire test, one of these little babies burned for 17 minutes and put out a good flame sufficient for even fire novices to get something burning with! Thanks. I was wondering how to make them after reading that firestarter post! I was wondering myself ..fixing to make some,,but then I never did see where the candle wicks came in at ? ?I,m assuming just stick a small piece into each ?????? There are no wicks, the lint and paper carton light with a match, so there’s no need for a wick. You’re planning to burn the whole thing when you light it. Those are crazy cool! I need to make some! Loved the commentary too! I am so making some of these as soon as my eggs are gone! Maybe for lunch today… By the way, you’ve been tagged on my Snuggle Bunch blog! Yes, I have tagged you also. So there. aI mske the same firestarters! That is neat, but do you have any other suggestions for a base? I recycle all my egg cartons to hold more eggs. With more than 30 chickens, I just can’t afford to destroy my egg cartons like that. These have saved me many times. We use cupcake liners. I keep my eyes open for liners on clearance. My mom used to make them in Christmas cupcake liners and would give out little gift baskets to take home. She would also add a small little pine cone in the center to jazz it up. Sawdust from hubby’s workshop also works well. Yes. Toilet paper tubes. Just stuff them with dryer lint, especially cotton-based, as in when you dry towels. Don’t pack them too tightly – you need air space in there to start a good fire. You can also use tubes from paper towels and cut them in half, thirds, etc., before stuffing. They work! Make your own using the recycling paper. Soak paper in water until it turns to mush. 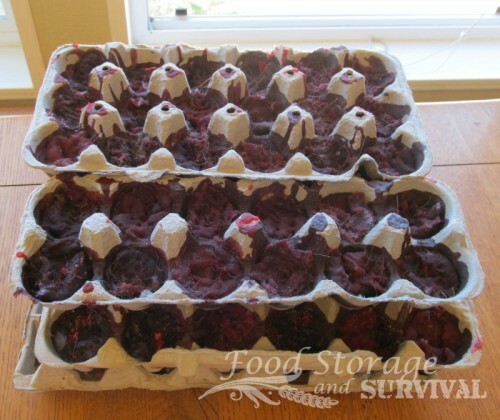 Use an old plastic egg tray for a mold. Anna–good question! I’m guessing anything paper would work–dixie cups, those little fast food condiment cups, something along those lines. Wouldn’t matter if the paper cup had a waxy coating on it since you’ll be dousing it with wax anyway. Thanks for asking! My L-Bow Mittens (actually my daughter’s mittens) came in the mail yesterday! What a great Valentine’s Day present!! The mittens are so neat. I really love them. Thank you so much for giving them to me through your fun giveaway. I love this idea and I can't wait to try it. Talk about recycling. You go. I also have used sawdust and I dip old shoelaces in the wax, let them dry put in the middle of them, before I pour the wax and I have a wick! I am going to visit my local laundromat for dryer lint. I’m definitely going to make a bunch of these for camping. How much wax do you put in each egg section? I never measured the amount of wax in each cup. Don’t pack the lint too tightly and then add enough wax that it soaks all the way through. I can remember my mom making these when I was little for our camping trips.. and also she showed my Girl Scout troup how to make them, and they worked every time. She used saw dust from my grandpas work shop (he always was glad to get rid of it lol) but for me now the dryer lint would be easyer to get a hold of. With 5 kids I am ALWAYS doing laundry. Great tutorial Angela! Pinned it. A little less messy than lint and Vasoline (which also burns very well). Hey, great tutorial. The burning time is awesome. For those who want to light this just with a ferro rod (or other kind of sparks) here is a tip. Once you have soak the lint with wax just put a little extra dry lint on top let it stick to the rest but without geting it soaked. The dry stuff will catch a spark and as it burns down it ignites the wax soaked lint. this way you have a fire starter that burns for 17 minutes and all you need is a spark. Yes! Really any cottony material with any oil/wax will work as a fire starter.